Anytime someone is injured on the job, there can be devastating consequences to their health and to their career. Every worker needs to know that regardless of the extent of the injury, they have rights. The law firm of Attorney George C. Malonis will vigorously defend those rights and secure the benefits you deserve. There can be so many questions and concerns after a work injury or accident. 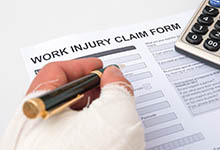 An injured worker may wonder if they can see their own doctor, if or when they can return to work, and if there will be temporary or permanent limitations on what they can do. Other questions may pertain to the exact nature of payments to cover medical bills and lost wages. While you may thoroughly trust your employer and the current Massachusetts workers’ compensation laws, it is still highly recommended that you have experienced and knowledgeable legal counsel by your side. Attorney Malonis will investigate the accident or injury scene, determine if there any underlying causes of the injury or accident that could increase the amount of compensation, and help document every medical and employment consequence of the accident or injury. With the help of injury Attorney Malonis, you can rest assured you will get the full amount and the full protection you deserve under Massachusetts workers’ compensation laws. If you have suffered a personal injury at work, it is imperative that you report the incident to your employer immediately. Then seek necessary medical care, being sure to document every detail. The law firm of Attorney George C. Malonis will interview and document witness statements and make sure you are fully aware of your rights and what you deserve. Some injuries may be more serious than others and could leave you disabled for some time. Was the injury caused by an unsafe work environment causing a slip or fall, or worse being struck by a falling object, tool or piece of equipment not stored properly causing a severe head injury. Either way, once we explore the details of your case and inform you of what you are entitled to, we will employ our experience and unmatched dedication to make sure you get those benefits. Having George C. Malonis in your corner is the first step to getting the best possible resolution for your workers’ compensation case. This law office was the great in getting me compensated for my work injury! Definitely call them if you are hurt at work and they are giving you a hard time.